This new Campaign included 80 teams from 77 cities and 13 countries. Collectively, Grades of Green Waste Campaign teams diverted over 229,000 pounds of waste (114 tons) from the landfill and educated over 25,000 leaders and community members around the world! These numbers will continue to grow as the student teams expand on their waste reduction projects. We are proud to announce the 2019 Spring Waste Campaign Finalist Campaign Teams, who achieved exceptional results. Please watch and share their campaign videos to get inspired by their innovative waste solutions. Mira Costa's team led 3 beach clean ups in their community during the month of March. They recruited volunteers by reaching out to their community through social media and local news outlets. The team educated participants about the effects of plastic and litter in our oceans and on our marine life. The result of the 3 beach clean-ups was about 250 lbs of trash; crushing their goal of 100 lbs. The team plans to continue hosting beach clean ups once per month. See their video HERE. The HEAR Club at CAMS high school was driven by the knowledge that people, on average, throw out 70 lbs of clothes every year and that the textile industry is the second highest contributor of waste. This team hosted several used-clothing drives as well as workshops that taught others how to upcycle used garments. They exceeded their goal to collect 10 bags during the clothing drives by collecting 11 bags. Some clothes were donated and some were upcycled into new garments. See their video HERE. At Whitney, the Waste Campaign Team members recognized that everyday a considerable amount of food waste was going to the landfill. By implementing a compost collection at lunchtime, the team collected about 30 lbs of food waste to put into their tumbler composter bin during the campaign. They continue to collect compostable scraps at lunchtime, educate the students and staff at their school and fundraise in order to buy a second (much needed) compost bin. See their video HERE. During the Waste Campaign, the Team working at lunch noticed the large number of good food items being thrown into the landfill bin. They were appalled, and wanted that food to go somewhere it could be eaten. The team decided they wanted to donate the food to the local Food Pantry and Homeless Shelter, and the Grades of Green mentors provided resources and guidance to help best put ideas into action. In order to raise awareness and encourage other schools in their community to start a Food Rescue program, Bridgeport shared their video and program with all the families at their school and with all the schools in their district. See their video HERE. Daves Avenue uses approximately 12,000 crayons every school year and as the Waste Campaign students discovered, crayons do not break down well in the landfill. With a goal in mind of diverting 120 lbs of crayons from the landfill, the team joined the Crayon Initiative. The Crayon initiative recycles old crayons into new crayons and donates them to children’s hospitals. The team set up boxes to collect the crayons to send them in to get recycled. See their video HERE. The team of 30 students recognized their school was wasting a lot of paper. They analyzed one class per grade level to get an estimate of how much paper is used and wasted. They collected boxes that were filled up completely to sort out those that are only 1-sided to be used again. For the paper that could not be reused, they put 3 actions in place: 1. find a paper recycling agency to take the bulk paper goods 2. shred them for packaging at school and 3. turn scrap paper into art projects for classrooms, including origami, bookmarks, and paper mache. See their video HERE. The Boys and Girls Club at Towne Elementary estimated that 100 milk cartons are destined for the landfill from their school everyday. They learned that it takes about 5 years for a milk carton to break down in the landfill and wanted to start recycling cartons at their school. They educated all the students and staff and created a fun basketball game as a way to encourage students to recycle their cartons and have fun with it. See their video HERE. The team at Will Rogers recognized a huge issue at lunchtime: 25 bags of landfill waste everyday. With the help of a few dedicated parents, the team set up sorting stations at lunch to separate liquids, recyclables, organic waste, landfill and trays. 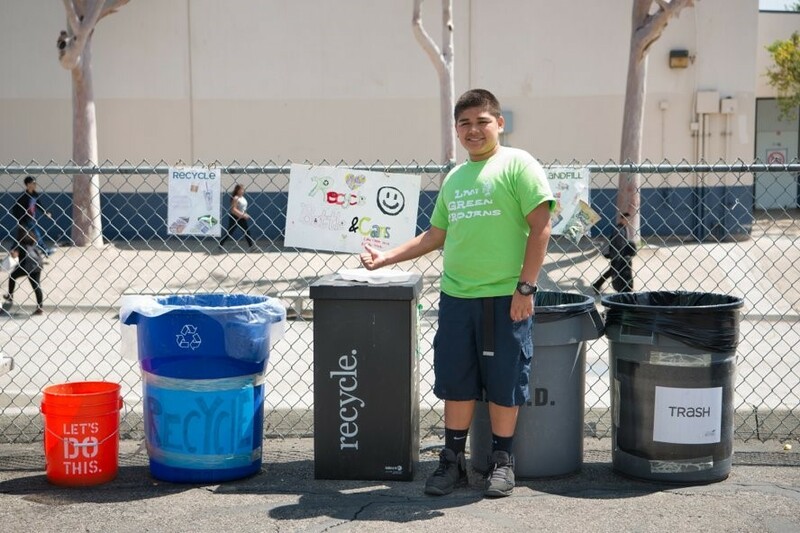 Since implementing the stations, over the course of the Waste Campaign, they decreased lunch time landfill waste by 85 trash bags by implementing sorting stations. They also decorated recycling boxes for all classrooms to increase paper recycling on campus. This innovative team created a virtual "Escape Room" to inform students about tackling waste. Specifically focused on single use plastics. Along with the Escape Room, they implemented “Plastic Free Fridays” encouraging fellow students to replace single use items with reusable items. They had the opportunity to present to their school board about the excess waste created by the food provider, including wrapping oranges in plastic wrap! See their video HERE. Students at this school took food waste VERY seriously. This team made sure that all food on campus was eaten or composted. In addition, the school made presentations and a song to show the importance of not wasting food. They involved their entire community including all students, parents, administration, school board, and government representatives. The team also had goals to limit plastic, reduce all waste going to the landfill – not just food waste, and to store food properly to reduce spoiled food. This team made a series of "how to" videos that taught their fellow students and community how to reduce waste, pack trash free lunches, and how to properly sort their waste at lunch. They also added on the Food Finders program so that any unopened cartons of food or beverages or unpeeled fruit could be donated to local families in need of food. The students have been dedicated to educated staff, administration, and parents through their “how to” videos. See their video HERE. Like to dance? Bottega Dance School has made public performances to educate others about Rome's environmental issues and infrastructural problems. The main issue the high schoolers focused on was overflowing garbage bins throughout the city. Along with their innovative video, they have presented the problem through conferences and art exhibitions. See their video HERE. The Hughes team found that the use of single-use condiment packets was a big waste issue on their campus. The packets end up becoming litter and often ends up in the ocean. The students prepared a proposal for the LBUSD Nutrition Services Department to switch from single-use condiment packets to sauce dispensers. They met with their district's Nutrition Services Manager to discuss the solution even further! Feeling inspired?! Join Grades of Green for our 2019 Fall Water Campaign here. And stay tuned for an update on the new theme for our Campaign teams!